Whether you have planned a bridal shower, a bachelorette party or a hen party, be sure that you will have fun! And after the party is over, head home, put your pajamas on and slide the sleep mask over your eyes. Sweet dreams! You Need Relaxing Beauty Sleep Before The Big Day! These mask will help you look and feel fresher than ever! To enjoy your beauty sleep, wear the sleep mask set by Thee Glamour Bride! The super soft satin sleep masks with the elastic strap will help you have a deep, uninterrupted sleep before the wedding! 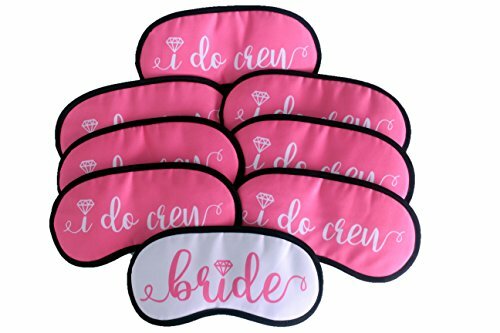 The set consists of one satin mask for the bride and 7 satin masks for the bridesmaids - the coolest "I do crew"! A Bachelorette Party Favor Gift That You Will Have Forever! Do you want to give a gift to your bridesmaids to thank them for being by your side and sharing this special experience with you? Is It Time For Your Bachelorette Party? Then get the girls, wear the matching sleep masks on your heads or necks and go out to party with the bride - to - be! For this reason, Thee Glamour Bride has backed up the sleep mask set with a satisfaction guarantee. So if anyone in the "I do crew" doesn't like her sleep mask, we will refund you - no questions asked. So don't hold back any longer! View More In Adult Novelty. If you have any questions about this product by Thee Glamour Bride, contact us by completing and submitting the form below. If you are looking for a specif part number, please include it with your message.